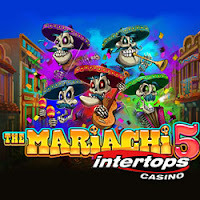 Intertops Casino wants to celebrate Cinco de Mayo with you, and what better way than with a new slot and some free spins! The unique casino has just unveiled Realtime Gaming's festive new Mexican-themed game, The Mariachi 5. Until April 30th, Intertops is giving you up to $500 and 50 free spins to try the new game. On the second and fourth reels, Wilds expand to cover the entire reel creating lots of possibilities for winning combinations. Scatters trigger free spins with extra Wilds and Scatters. "Holy guacamole!" said Intertops casino manager. "This game is hotter than a jalapeno!" The Mariachi 5 is a colorful 5-reel slot game with five mariachi players, lively music and lots of prizes. When three pinatas appear, you'll pick one of the five Mariachi musicians to reveal bonus prizes: up to 15 free spins with up to 8X win multipliers. Cinco de Mayo is an annual celebration held on May 5 to commemorate the Mexican Army's victory over the French Empire at the Battle of Puebla, on May 5, 1862. The most trusted online casino, Intertops Casino has been entertaining players all over the world for more than twenty years. It offers hundreds of slots and table games like Blackjack and Roulette from Realtime Gaming. The most popular games are available in the mobile casino for smartphones and tablets as well as the instant play and downloadable casinos for desktops and laptops.